Stadler has two reasons to celebrate: the company’s CEO, Peter Spuhler, recently signed two new contracts in Poland. The first one involves the construction of 35 trams for MPK Krakow, and includes the option for an additional 15 trains. The second agreement was concluded with the regional rail operator Koleje Mazowieckie for the delivery of 71 FLIRT EMU trains. Other promising tenders are in the works. This article was originally published on 17.01.2018 and updated on 02.06.2018 and 08.04.2019 to reflect the latest call offs of the frame contract. “We’ve now broken into the Polish market” Peter Spuhler, owner and CEO of Stadler Rail. Stadler and the railway company Koleje Mazowieckie in Mazovia have reached an agreement for the delivery of 71 new FLIRT EMU trains. The contract was signed in Warsaw this morning by Peter Spuhler and Peter Jenelten in the presence of chairman of the board Robert Stępień and member of the board Czesław Sulima. 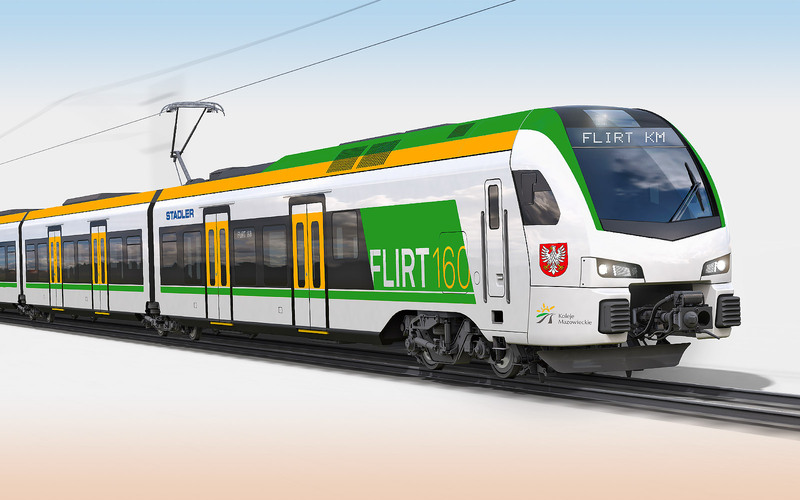 Stadler received its first order from Poland in 2006 for 14 FLIRT trains. These trains are in operation along regional lines in Mazovia, and are also in use in Silesia. FLIRT trains are known for their outstanding reliability. And as passenger surveys show, they are also highly popular. Ten of these FLIRT trains will be operated by Koleje Mazowieckie in the future. “We’re thrilled to have won the new Koleje Mazowieckie tender, and look forward to supplying Mazovia with our latest generation of safe, reliable, and comfortable trains. The modern features of these trains can be enjoyed by both train operators and passengers alike,” declared Peter Spuhler during the signing of the contract. As well as being spacious, the new FLIRT trains can reach speeds of 160 km/hour. They come equipped with ETCS level 2 automatic train control systems. Contemporary doors, high-performance air conditioning, visual and audible passenger information systems, and on-board Wi-Fi offer passengers the ultimate in riding comfort. The vehicles are fitted with special supports and toilets designed for people with disabilities. There is also plenty of space for baby carriages and bicycles. Finally, each vehicle is equipped with a defibrillator and an intercom system so passengers can contact the conductor in the event of an emergency. The new order is valued at 2.2 billion PLN, making it the highest bid for regional trains ever to be submitted in Poland. Stadler Polska was founded in 2007 in the city of Siedlce. Back then, the company operated out of an assembly plant on a site leased by the Polish State Railways (PKP). In the years that followed, the factory was modernized and developed into a state-of-the-art production facility. Currently employing around 700 skilled workers, Stadler Polska is one of the largest employers in Siedlce. Impression: Stadler Rail – we can not imagine this will be the final livery. This impression is a standard Stadler portfolio image with different colours, green and yellow in stead of blue. Railcolor: The Koleje Mazowieckie contract for 71 units is one of the biggest contracts in the Polish market of the past years. Three companies placed a bid: Pesa (with ZNTK Mińsk Mazowiecki), Stadler Rail and Newag. Medio 2017 KM already announced it had selected Stadler Rail as preferred bidder, but both competing companies objected this this outcome. But their complaints about selection criteria were rejected in court and thus could KM continue the process by awarding to contract to Stadler. Early May 2018 Koleje Mazowieckie awarded Stadler Rail the first fixed order for six 5-car FLIRT 3 trains within the agreement. 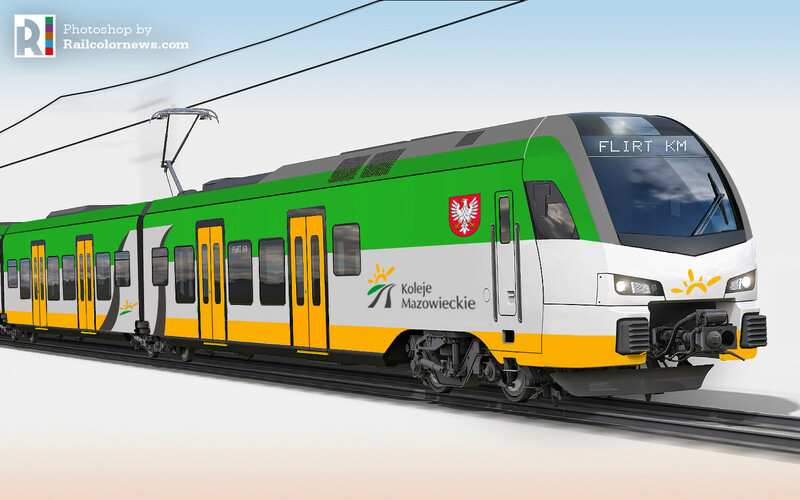 Voivodeship Mazowieckie is co-financing the purchase of the FLIRT 3 trains. The trains are intended for the Warsaw-Działdowo route and should be delivered by September 2019. The new KM trains will be air-conditioned and equipped with WiFi. They will feature visual and audible passenger information systems and monitoring equipment. They will offer space for the disabled, for wheelchairs and bicycles and have toilets. Emergency equipment including an passenger/driver intercom and defibrillators is also on board. The vehicles will have a maximum speed of 160 km/h.